© 2002, © 2019 by Paul Freeman. Revised 4/1/19. 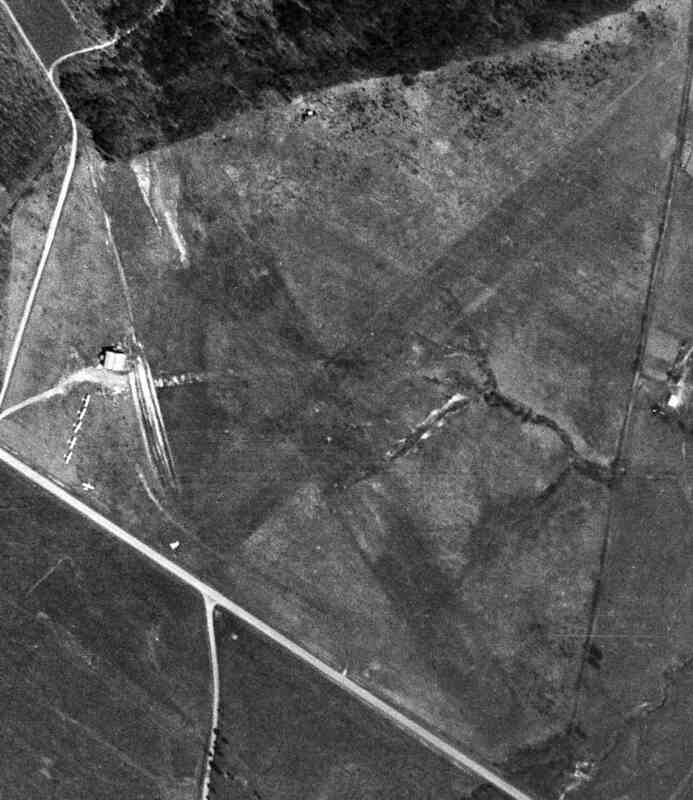 A 3/5/71 USGS aerial view of Flying T Farm Airfield. Andy Tyler recalled, “My dad built this farm & this 2,000' airstrip with a 2 plane T-hangar in the 1960s to fly our Cessnas (210 & 150) out of. It was built around 1969 first as a gravel strip then professionally paved. 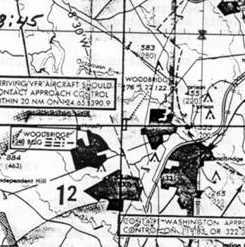 The Flying T Farm Airfield was not yet depicted on the 1971 Washington Sectional Chart. 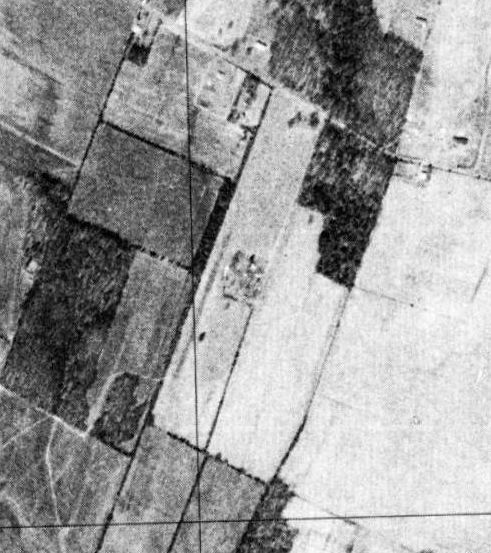 The earliest depiction which has been located of Flying T Farm Airfield was a 3/5/71 USGS aerial view. It depicted a single northeast/southwest runway, with a few small buildings & what appears to be 1 light single-engine plane on the southwest side. was on the 1975 Washington Sectional Chart. It depicted Flying T as a private airfield with a single paved 2,000' northeast/southwest runway. 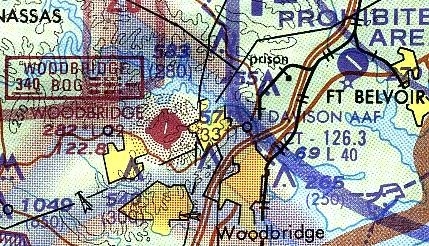 Flying T Farm Airfield, as depicted on the 1989 USGS topo map. as having a single northeast/southwest paved runway, with a few small buildings on the southwest side. The February 2009 Washington Terminal Aeronautical Chart depicted Flying T as a private airfield with a single paved 2,000' northeast/southwest paved runway. as having a single northeast/southwest paved runway, along which a few trailers were parked. 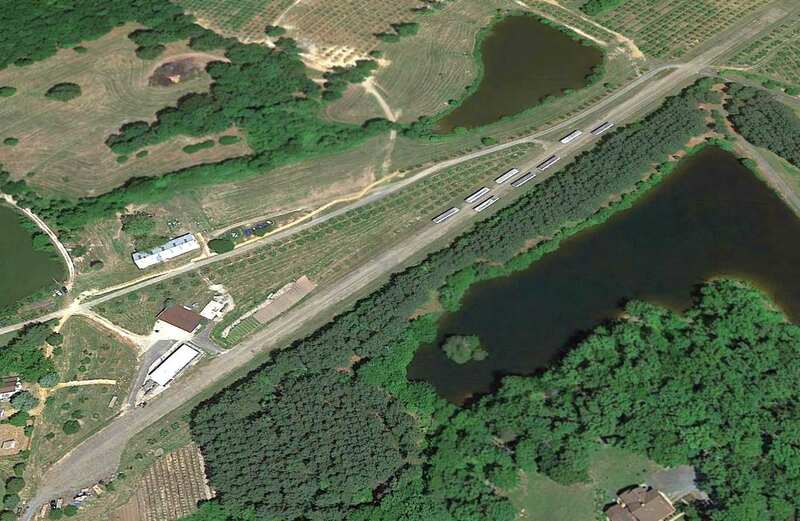 A 2015 aerial view looking north depicted Flying T Farm Airfield as having several trailers parked along its runway. Andy Tyler reported in 2016, “The place was sold twice since & the farm is used as an orchard, and the former strip, although in fairly good condition, now is used to park trailers & equipment. I miss it incredibly but things happen & change is inevitable. Flying T Farm Airfield continues to be depicted on the 2016 Washington Terminal Aeronautical Chart. This is really a safety hazard for this airfield to continue to be depicted on aeronautical charts, given that it has not been used for flying in years, and instead has trailers parked along its runway. 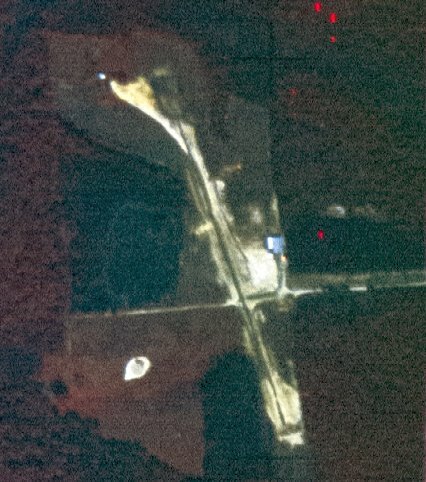 Flying T Farm Airfield is located southwest of the intersection of Ramoth Church Road & Courthouse Road. Thanks to Andy Tyler for pointing out this airfield. 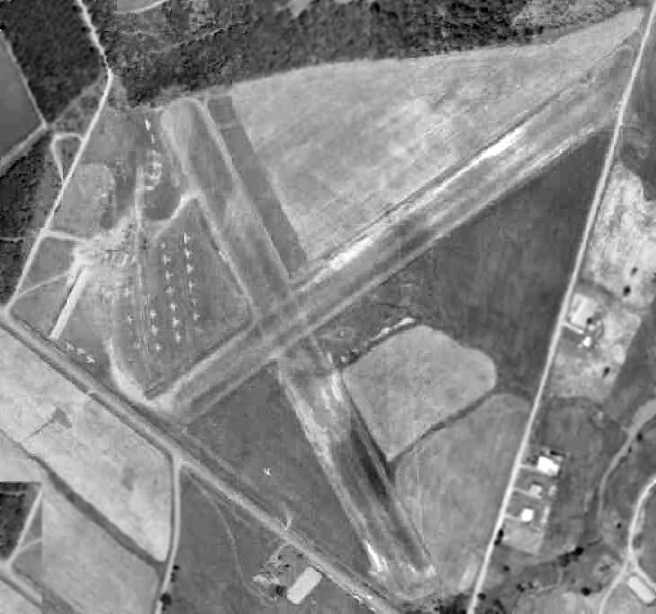 Valley View Airport, as depicted on a 3/9/77 USGS aerial photo. 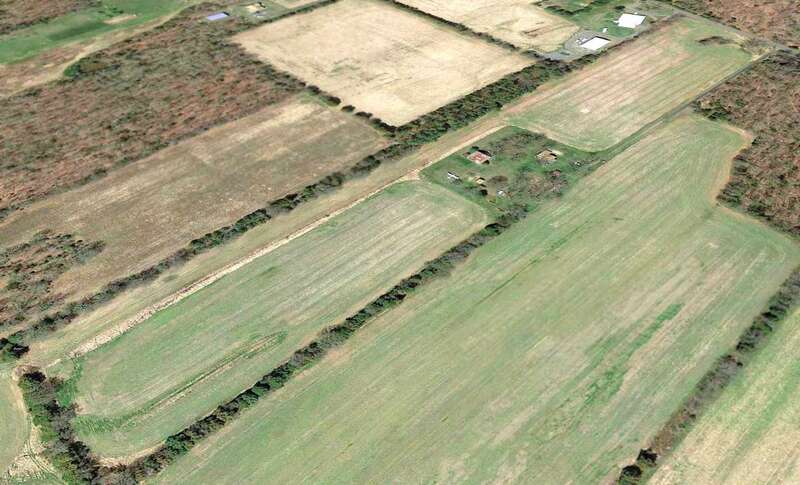 Not much is known about this apparent former private airfield, other than its name. which depicted a single unpaved northeast/southwest runway, with a cluster of small buildings on the east side. 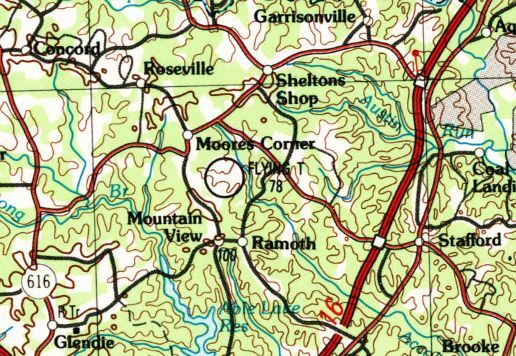 Valley View Airport was not depicted at all on USGS topo maps from the 1970s through 2015. The earliest aeronautical chart depiction which has been located of Valley View Airport was on the September 1981 Washington Terminal Chart (courtesy of Ron Plante). It depicted Valley View as a private airfield having an 1,800' unpaved runway. 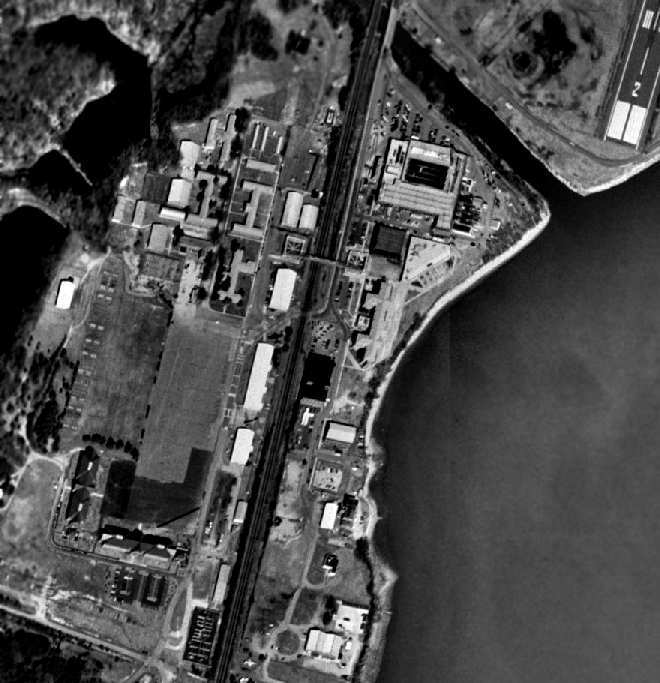 The earliest photo which has been located showing an aircraft at Valley View Airport was a 1994 USGS aerial view looking northwest. It depicted 1 light single-engine aircraft parked north of the hangar. 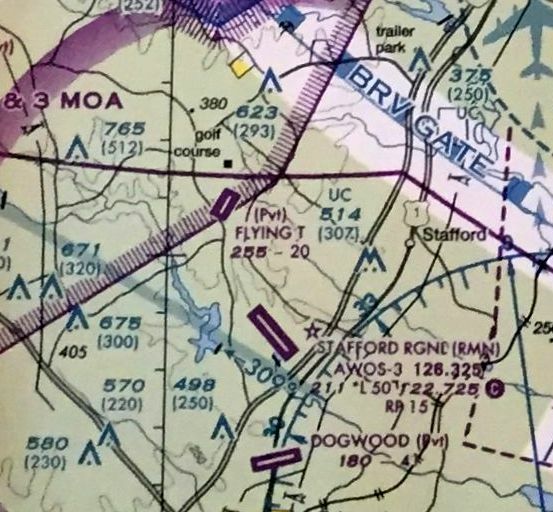 The last aeronautical chart depiction which has been located of Valley View Airport was on the February 2001 Washington Terminal Chart (courtesy of Ron Plante). 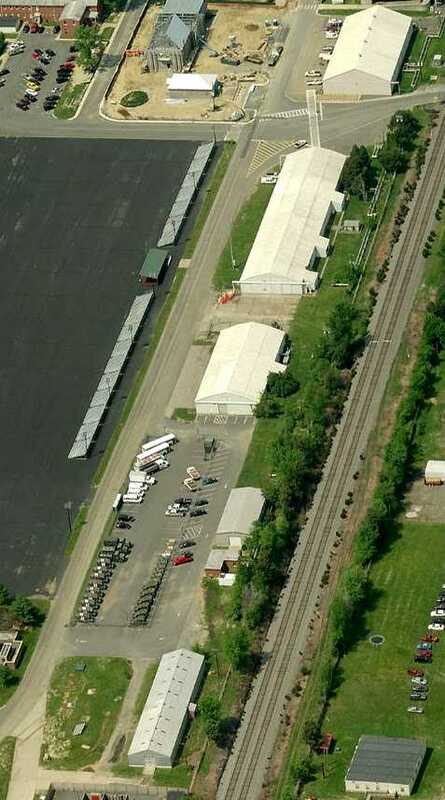 A 2002 aerial photo showed the 1 aircraft remained parked on the north side of the hangar. a position in which it remained in aerial photos for the next 12 years. with 1 light single-engine taildragger parked to the south. and the single-engine aircraft remarked parked in the same spot, on the south side of the hangar. As of 2015, Valley View Airport was not registered with the FAA, but it was still depicted on street maps. A 5/20/16 aerial view by David Cuff looking north at Valley View Airport, taken from a drone aircraft. David reported, “I went to Valley View Airport & shot a video of it with a drone. I talked to the guy who started it on the phone the other day; he's 92 & lives in Florida. 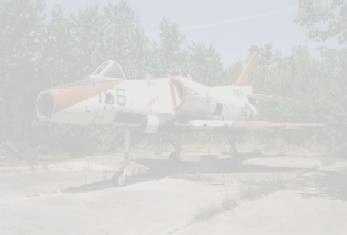 The airplane that has been sitting there for years belonged to a friend of his who passed away. The logbooks have been lost or are not complete so it can't fly again apparently. It looks all complete. A 5/20/16 aerial view by David Cuff looking south at Valley View Airport, taken from a drone aircraft. Valley View Airport is located southwest of the intersection of Colvin Lane & Arden Road. Thanks to David Cuff for pointing out this airfield. Le Beau Airport, as depicted on the 1949 Washington Sectional Chart. Donald Libeau established an 1,850' private turf field during WW2 on Libeau family land. Strangely, official charts misspelled the name as Le Beau. The 1949 Washington Sectional Chart depicted Le Beau Airport as having a 1,900' runway. 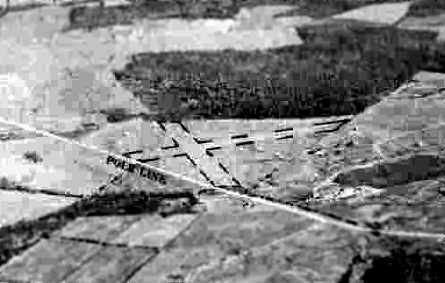 A 1949 aerial photo depicted Libeau Airport as having a single unpaved northwest/southeast runway. Two single-engine planes were visible next to a small building on the northeast side of the runway. The 1951 Washington Sectional Chart depicted Le Beau Airport as having a 1,900' unpaved runway. 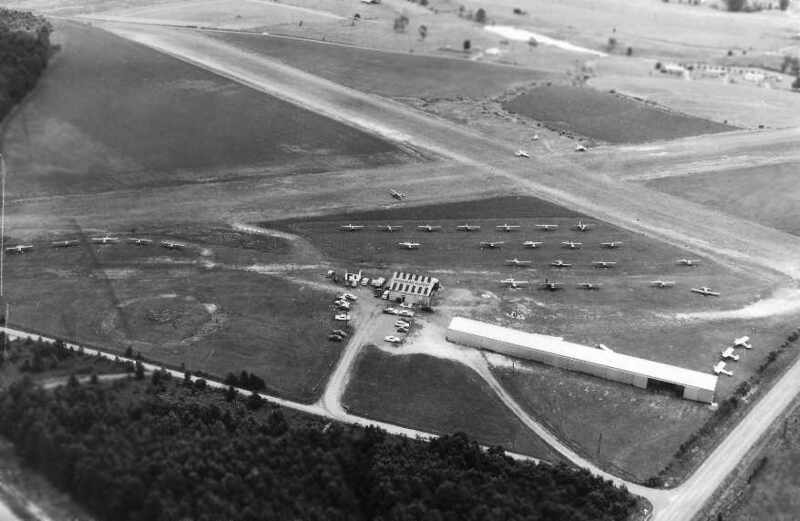 A 1952 aerial photo depicted 2 single-engine planes next to a small building on the northeast side of Libeau Airport. 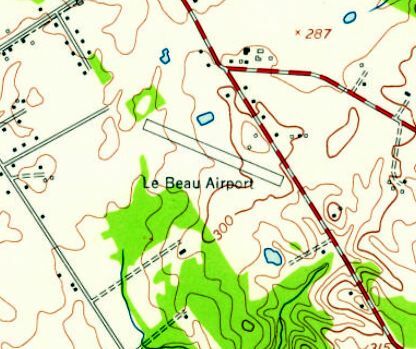 The 1956 USGS topo map depicted Le Beau Airport as having a northwest/southeast runway. 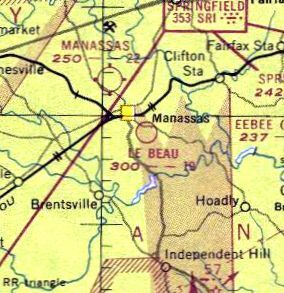 The last depiction which has been located of Le Beau Airport was on the 1956 Washington Local Aeronautical Chart (courtesy of Tim Zukas). It depicted Le Beau Airport as having a mere 1,800' unpaved runway. According to the book "Virginia Airports", Libeau Airport closed in 1960 when the property was sold. 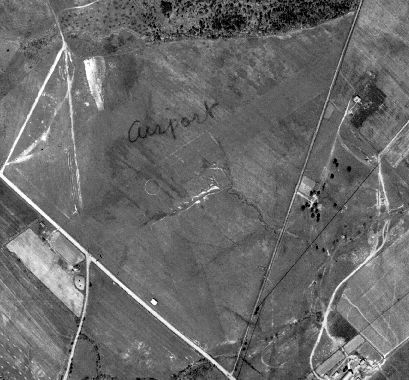 A 1962 aerial photo showed that Libeau Airport was still intact, but there were no aircraft visible on the field. 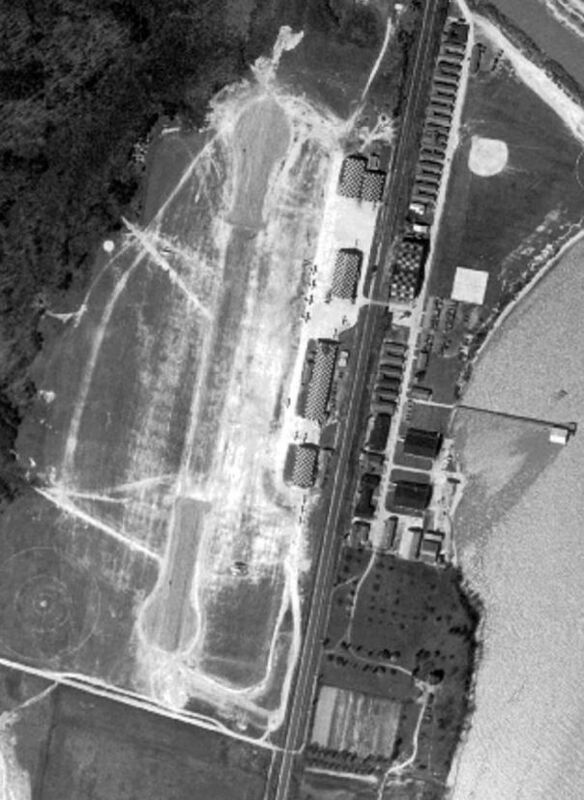 A 1963 aerial photo showed no change in the configuration of Libeau Airport. 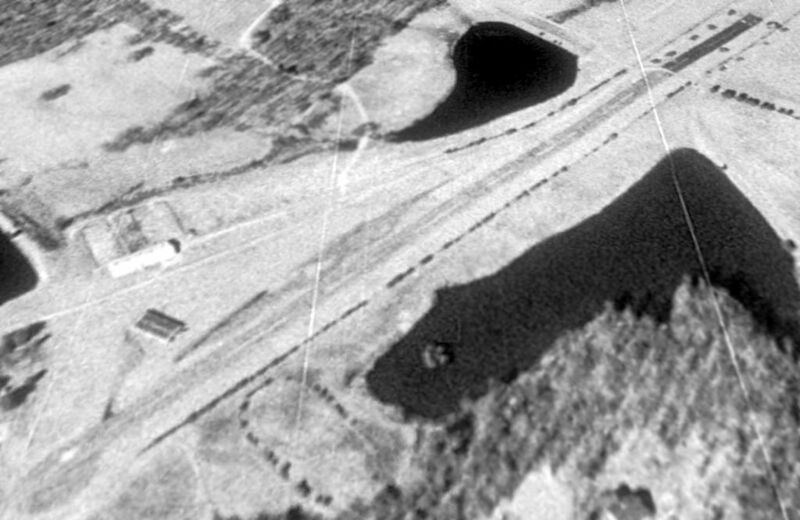 A 1964 aerial photo appeared to show that the building on the northeast side of Libeau Airport had been removed. Libeau Airport was no longer depicted on the September 1981 Washington Terminal Chart (courtesy of Ron Plante). 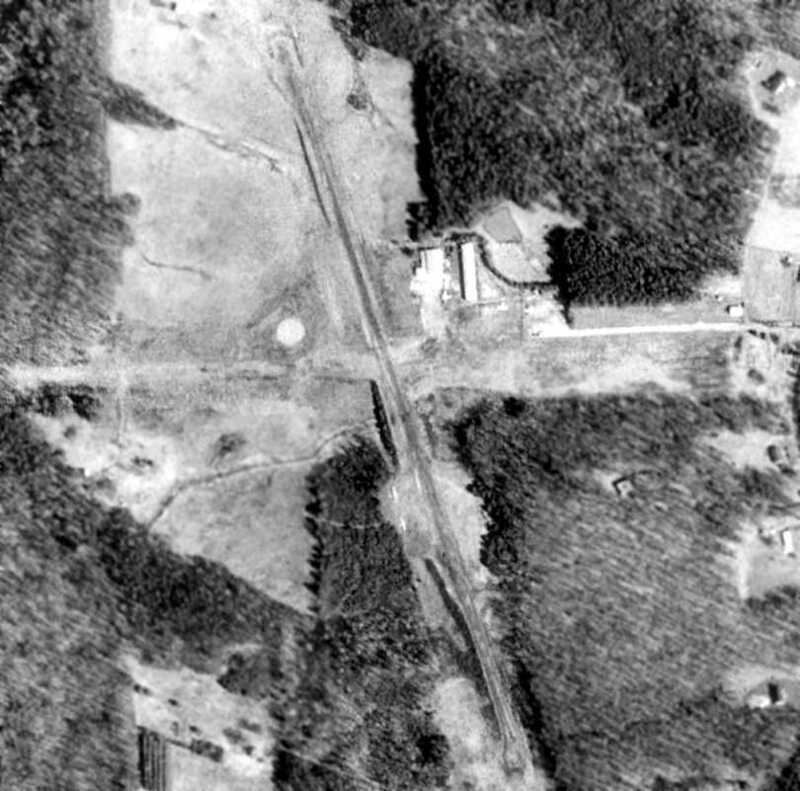 A 1981 aerial photo showed that the site of Libeau Airport remained clear. 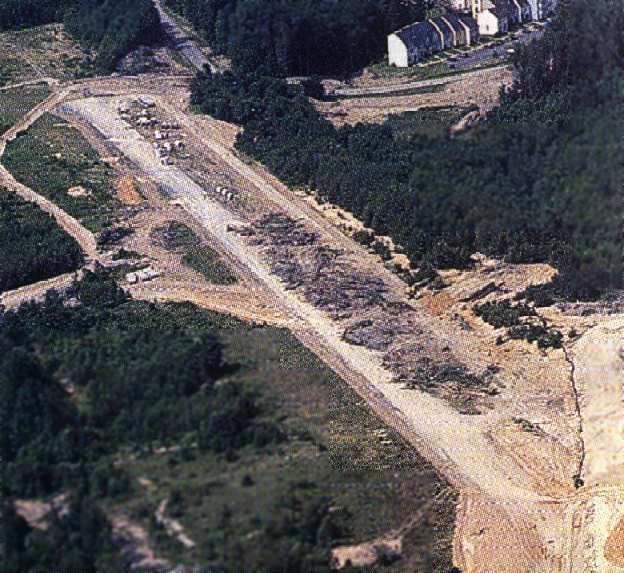 A 1994 aerial photo showed that houses had been built over the site of Libeau Airport. 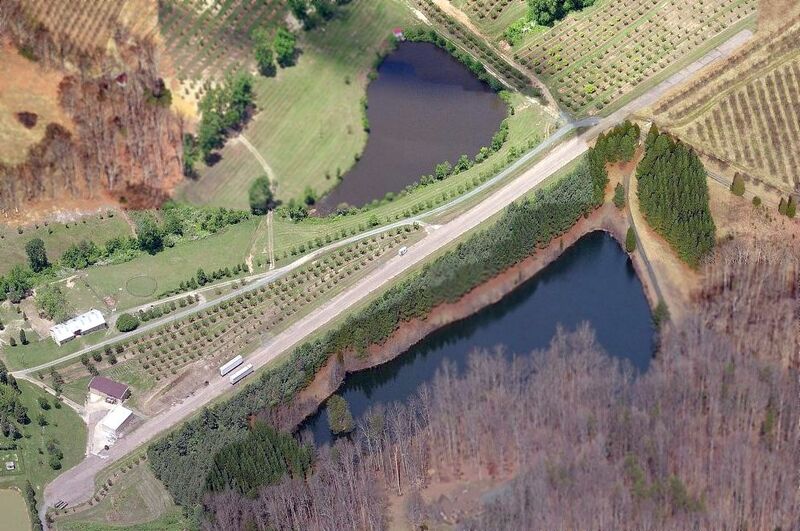 A 2012 aerial photo showed no trace of Lebeau Airport. The site of Libeau Airport is located west of the intersection of Lake Jackson Drive & Libeau Drive, appropriately enough. 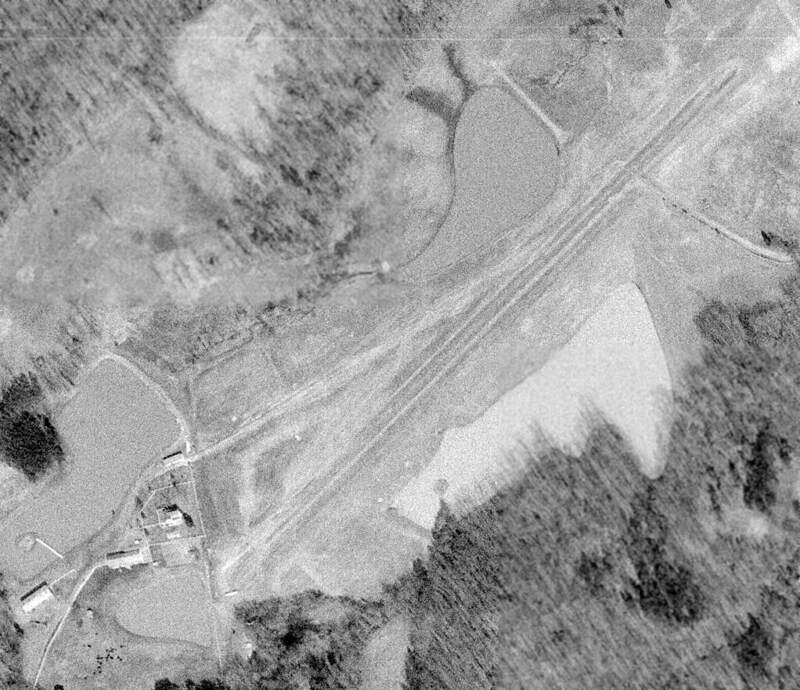 Hartwood Airport, as depicted on a 9/25/70 USGS aerial view. 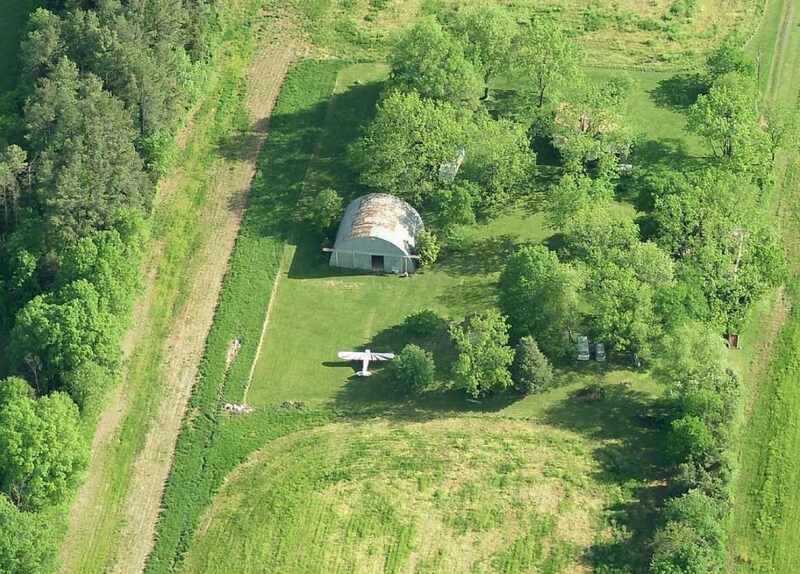 Yet another small general aviation airport in Northern Virginia lost to more-lucrative land uses. or the February 1961 Washington Local Aeronautical Chart (courtesy of Scott Kimball). Hartwood Airport opened in 1969, and was once a base for skydivers. 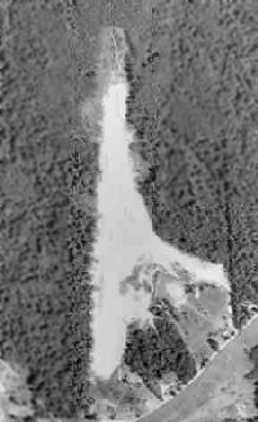 The earliest depiction which has been located of Hartwood Airport was on a 9/25/70 USGS aerial view. It depicted Hartwood as having 2 unpaved runways & a hangar on the northeast side. located on over 180 beautiful acres only 50 miles south of Washington D.C. In operation since 1969, Hartwood boasts one of the highest safety records in the industry. We offer state of the art equipment, comprehensive training, licensed instructors & great facilities for both new & experienced jumpers. Our experienced staff includes coaches for beginners as well as organizers for group & team Relative Work. was on the 1971 Washington Sectional Chart (courtesy of Ed Francis). It depicted Hartwood as a private airfield having a 2,000' unpaved runway, conducting parachute operations. 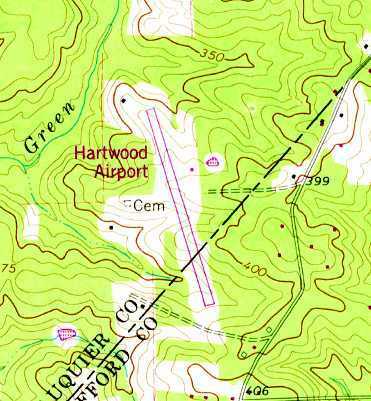 Hartwood Airport was not yet depicted on the 1972 USGS topo map. 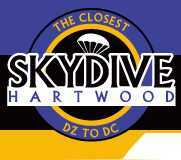 depicted Hartwood as a public-use airport with a 1,900' unpaved runway, conducting parachute operations. 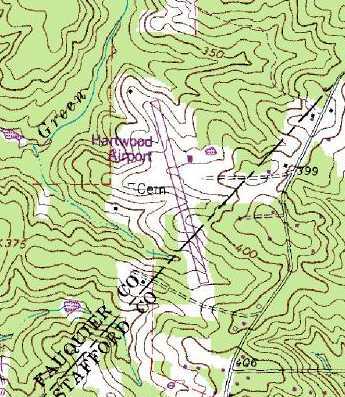 The earliest topo map depiction which has been located of Hartwood Airport was on the 1978 USGS topo map. It depicted Hartwood Airport as having a single paved northwest/southeast runway, with a single small building on the east side. 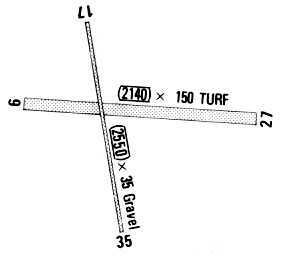 A 1988 airport directory depicted Hartwood Airport as having a 2,550' gravel Runway 17/35 & a 2,140' turf Runway 9/27. The airport was said to conduct parachute jumping daily, and to have ultralight & glider activity. with a single small building on the east side. An October 1992 aerial view looking east depicted Hartwood Airport to have 2 perpendicular runways, with a hangar on the northeast side. An undated photo presumably of the Skydive Hartwood Twin Otter at Hartwood Airport. and 4 light aircraft on the southwest & northeast sides. with 2 hangars on the northeast side. The operator was listed as Hartwood Aviation, and the manager was listed as H.C. Schoelpple. Hartwood Airport had 2 turf runways: 2,470' Runway 17/35 & 2,000' Runway 9/27, and parachute jumping. 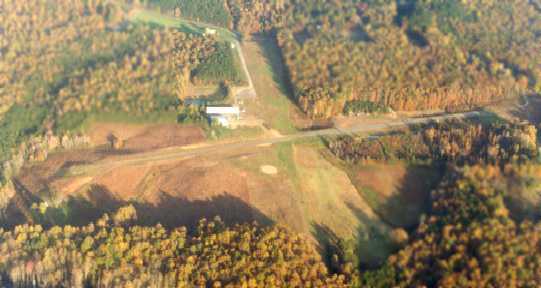 A 1/1/02 aerial view showed 3 aircraft at Hartwood Airport: 2 gliders on the southwest side, and 1 single-engine aircraft next to the hangar. The airfield facilities appeared unchanged from the 1994 view. 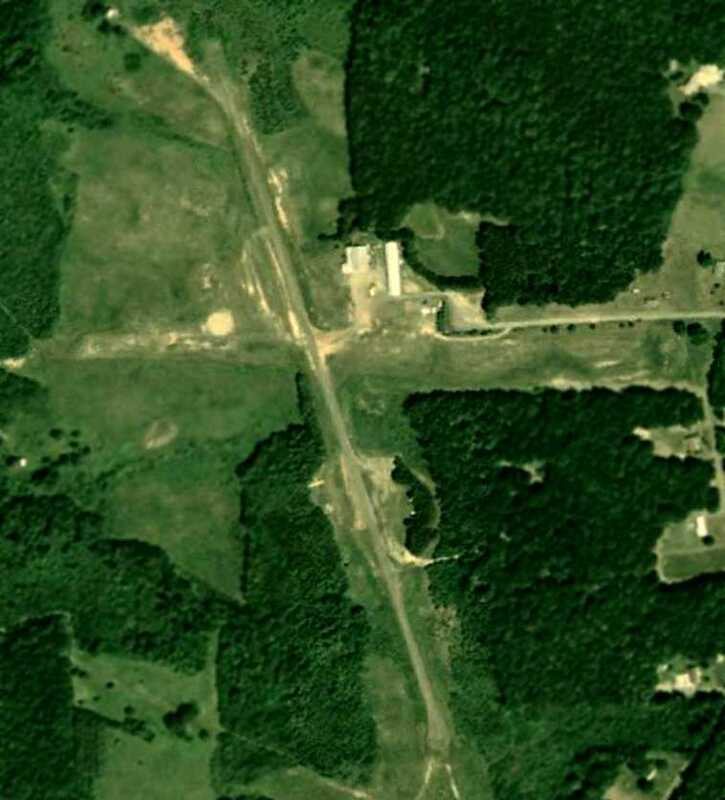 The last photo which has been located showing Hartwood Airport before its redevelopment was a 5/23/06 aerial view. 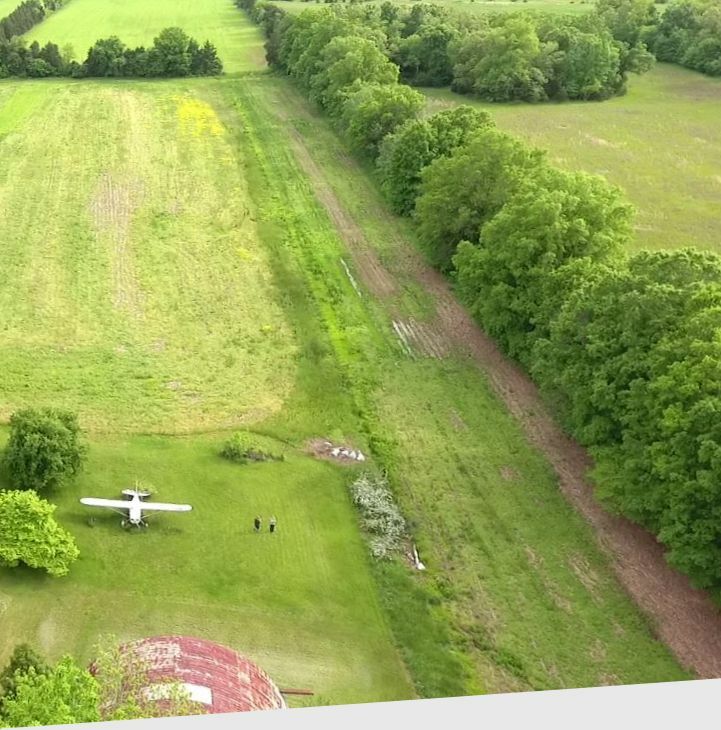 Only a single aircraft (possibly a glider) was visible on the southwest side of the field. 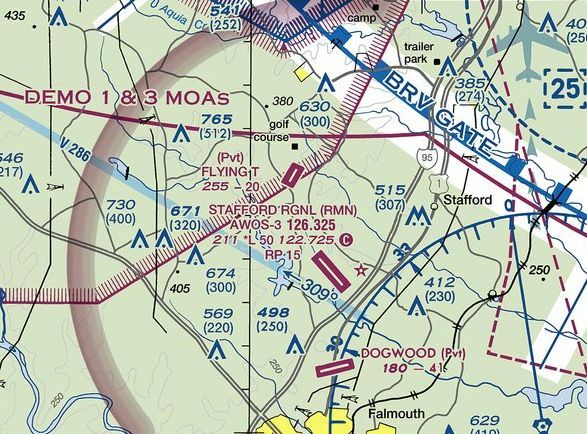 “Planes do not land at Hartwood Airport in Stafford County these days. The runway looks more like a roadway now, and a toll booth sits on the former taxiway. It is now a 'test lane' facility operated by Unisys Corp. & the U.S. Customs & Border Protection Agency. It is home to a simulated international border crossing where technology akin to an E-ZPass is being evaluated for use at border crossings. and has been operating on the Fauquier side for 3 years. Unisys plans to expand its operation into Stafford. The property is zoned for agricultural use in Stafford, which did not allow this sort of use by right or by conditional-use permit. so Customs & Border Protection can expand the test-lane facility at the airport. The article continued, “Fauquier officials passed a similar permit in February for the expansion. Unisys would like to begin construction immediately, so the permit process was expedited in both counties. Stafford staff recommended approval of the conditional-use permit. 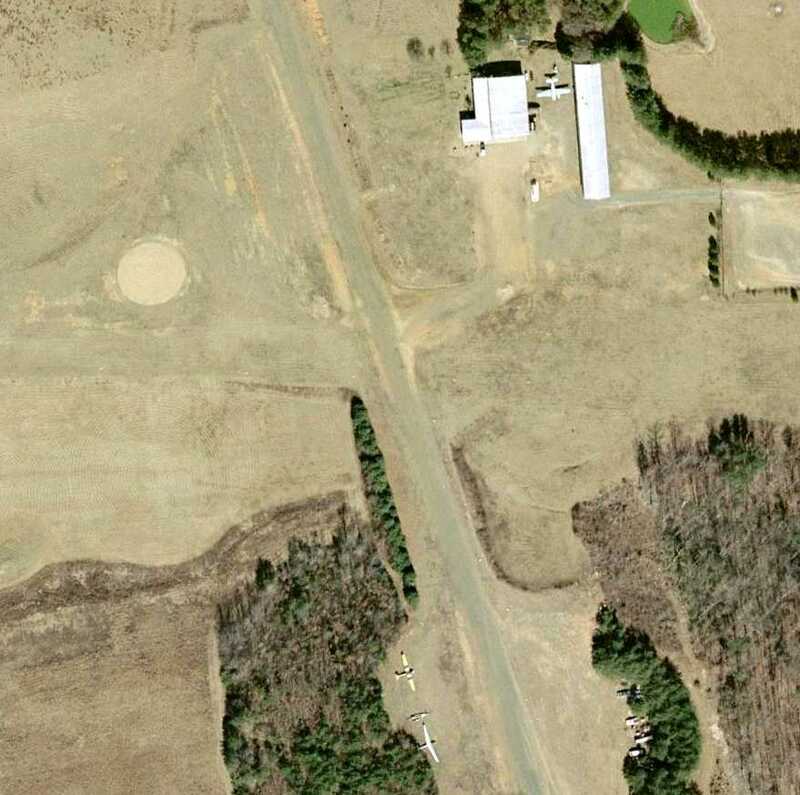 as this little grass-runway country airport certainly never had tractor-trailers operating on the property. "It's very low-key," Snellings said. "It's been there for 3 years & I've never heard anyone complain about it." Randall Burdette reported in 2010, “Hartwood was a privately-owned public-use airport. It had numerous problems with obstructions around the airport. it can sometimes be costly for an airport owner to maintain a safe operating environment. it gave them some options for a cash influx. and conducting glider & parachute operations. which claims the airport has been defunct since 2007. 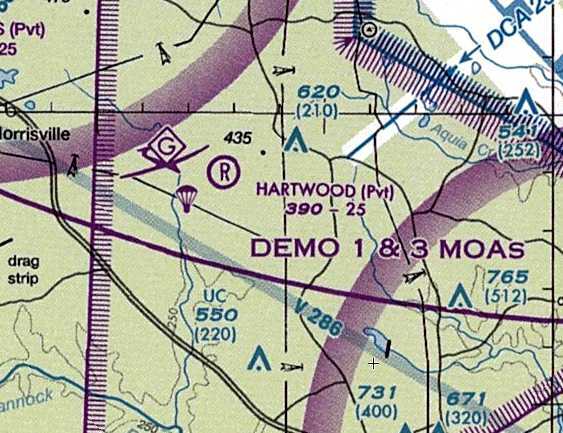 Randall Burdette reported in 2010, “We have submitted Hartwood Airport to be removed from the FAA charts on several occasions. and an old AgCat style plane was half-out of the hangar & a guy was wrenching on it. I struck up a conversation with him & found out that he still flies his plane out of what is left of the east/west turf runway adjacent to the access road. A 2018 aerial view looking northwest at Hartwood Airport shows what has become of this former little country airport – now a border security test site. Most of the runways have been paved over, but the 2 former hangars remain standing. 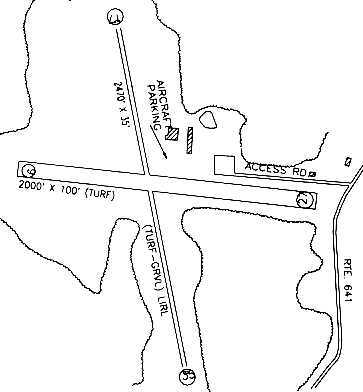 The site of Hartwood Airport is located west of the intersection of Dophie Road & Cropp Road. 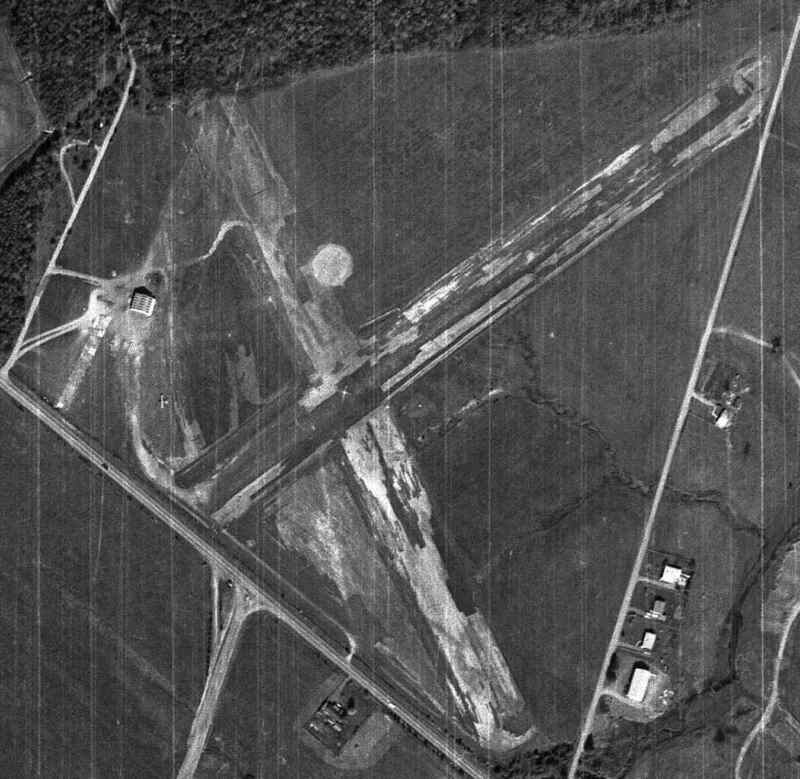 A 1962 aerial view depicted the Woodbridge Airport as little more than a dirt clearing. No aircraft, hangars, or other improvements were discernible. 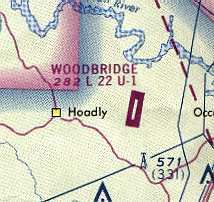 Nothing was yet depicted at the site of the Woodbridge Airport on the 1957 USGS topo map. the Woodbridge Airport was built in 1959 by the Steve Whitecoff family. as it was not depicted on the 1961 Washington Local Aeronautical Chart (courtesy of Mike Keefe). which described Woodbridge as having a single 2,200' dirt runway. 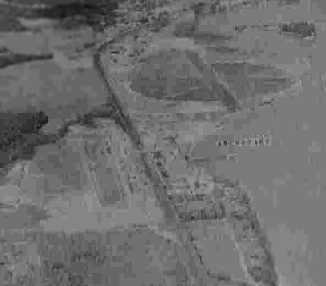 The earliest depiction which has been located of the Woodbridge Airport was a 1962 aerial view. It depicted the Woodbridge Airport as little more than a north/south dirt clearing. A 1963 aerial view showed that 3 light single-engine aircraft were parked on the east side of the field. 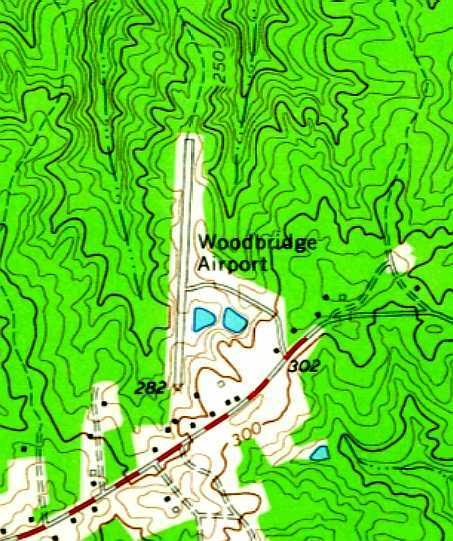 Woodbridge Airport, as depicted on the 1963 USGS topo map. was on the 1963 Washington Local Aeronautical Chart (courtesy of Mike Keefe). It described Woodbridge as having a single 2,200' bare runway. 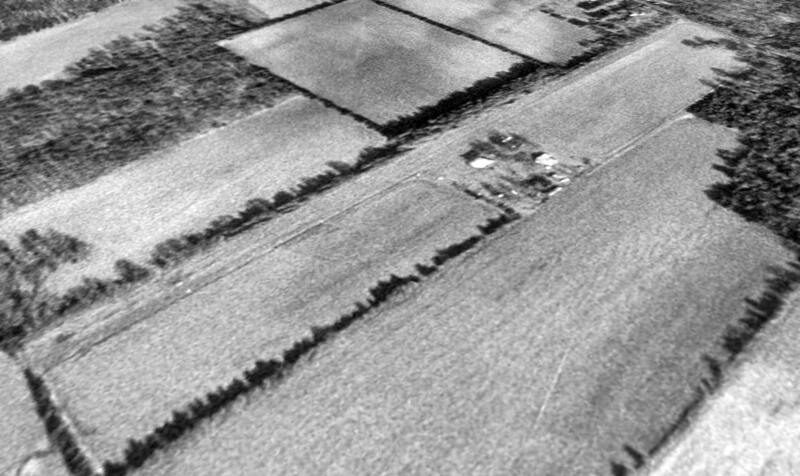 A 1964 aerial view showed that 2 small buildings had been added at some point in the previous year on the east side of the field. Three light single-engine aircraft were parked on the east side of the field. described Woodbridge as having a single 2,200' bare runway. with a few small buildings on the south side. 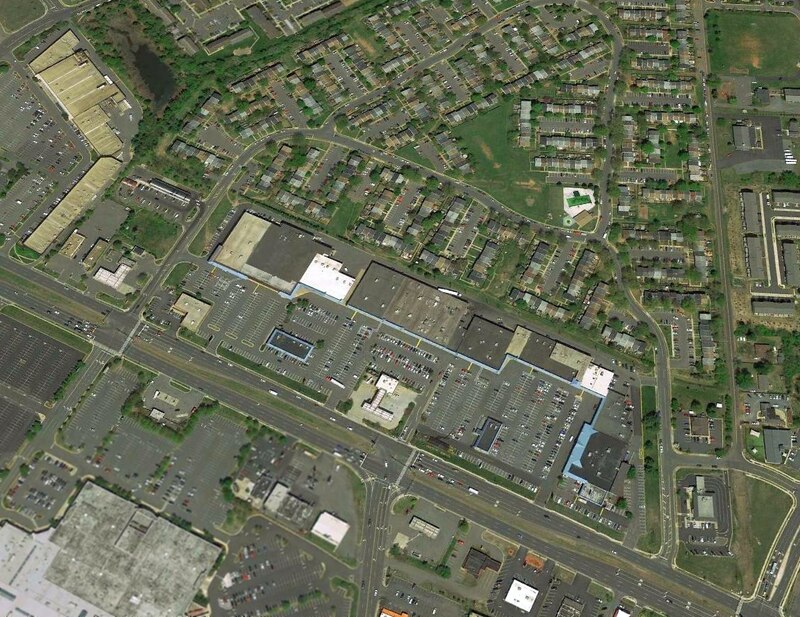 Note how undeveloped the surrounding area was. 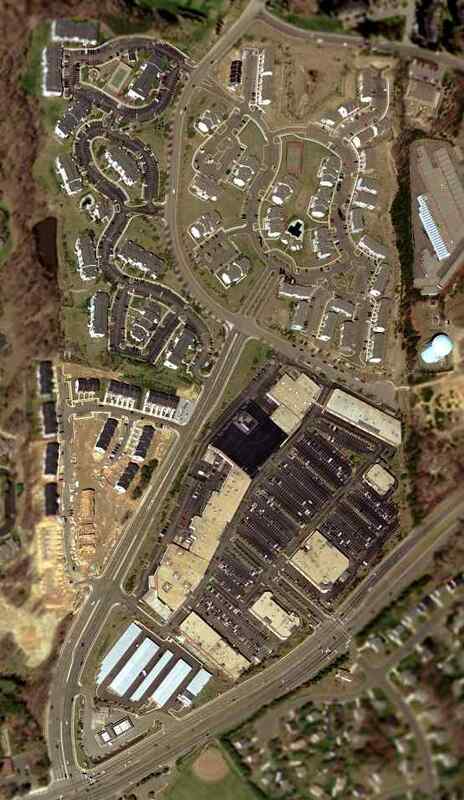 depicted Woodbridge as having a 2,200' bituminous Runway 1/19. and a taxiway led from the middle of the runway to a ramp with a hangar & office along the east side. Christian Roberts recalled, “I learned to fly out of W22 in June 1967 using a Cessna150 that the Whitecotts owned. They has just finished paving the runway. especially with that dip at the end of the runway. He said 'You learn to fly & land here, you can land anywhere.' He was right! The airfield configuration at Woodbridge Airport was still the same in the 1968 Virginia Airport Directory (courtesy of Don Thompson). It listed the operator as S.F. Whitecott. from Gaithersburg, MD back to my home base Richmond Aviation at Richmond International Airport for maintenance. Abeam of Woodbridge at 5,000' the airplane suffered a sudden catastrophic engine failure (broken crankshaft). according to an article in the 6/1/87 issue of the Washington Post. A circa 1970s aerial view by Ed Stallknecht (courtesy of Robert Sullivan) looking north at Woodbridge Airport. and often going with Mr. Benn on a quick air-trip to retrieve a part, deliver a charter, etc. and he bought the Woodbridge Airport when that one closed in the late 1960s. (but more importantly to be around airplanes). Ned continued, “I always enjoyed the challenge of flying into & out of Woodbridge. made famous by one of the 'around-the-world' trips for single engine airplanes. 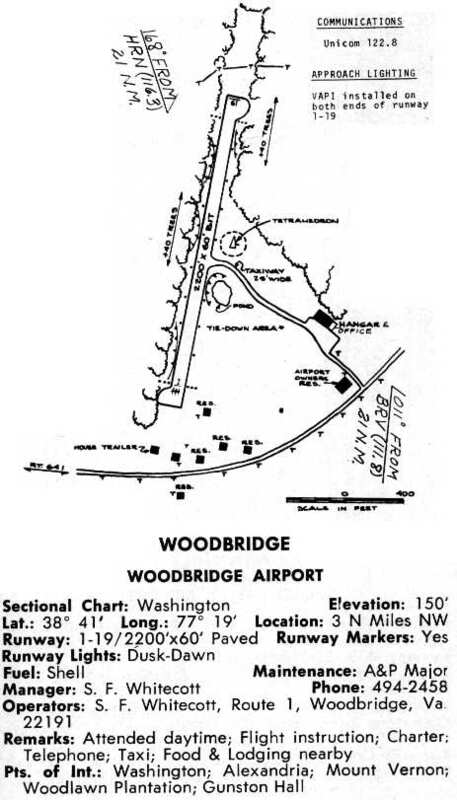 Woodbridge Airport, as depicted on the 1975 Washington Terminal Area Chart (courtesy of Ed Drury). "In later years there was a parallel taxiway & a much bigger ramp, with a larger hangar at the south end of the ramp. One unusual feature of the airport is that the runway elevation was about 25' below the ramp. The western end of the taxiway (just before the runway) had a very steep section. Care had to be taken going down the hill, and it took a few seconds of full power to get up the hill. The runway itself was hardly level, with a big dip in the southern half that continued uphill to the north." 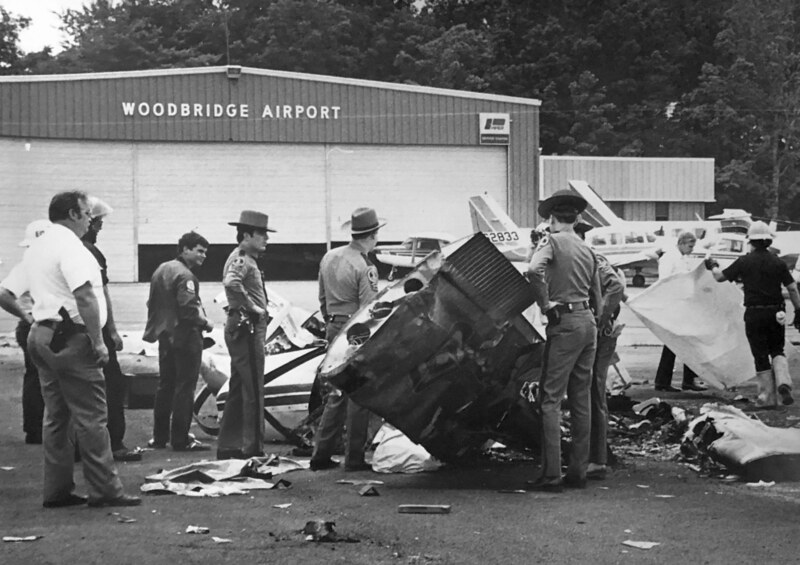 A 1977 photo of police with the wreckage of an aircraft accident in front of a Woodbridge Airport hangar (courtesy of Susan Scaglione). A 1979 aerial view depicted Woodbridge Airport perhaps at its zenith of popularity, with over 50 light aircraft visible on the field. A 1980 photo by Charles Kirky looking along Woodbridge's rolling Runway 1, with 2 Pipers & a Cessna prearing for takeoff. The September 1981 Washington Terminal Chart (courtesy of Ron Plante) depicted Woodbridge Airport as having a 2,200' paved runway. 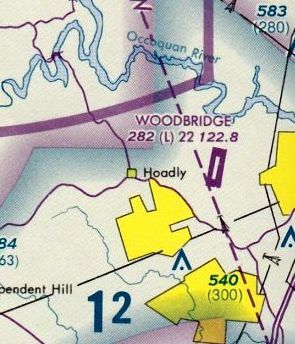 Woodbridge Airport was described as having a single 2,246' asphalt Runway 1/19, and the operator was listed as Woodbridge Airport Inc.
Woodbridge Airport, as depicted on the 1983 Maryland State Aeronautical Chart. It also depicted that Woodbridge Airport had its own NDB navigational beacon on the field. with dozens of light aircraft parked on the southeast side. 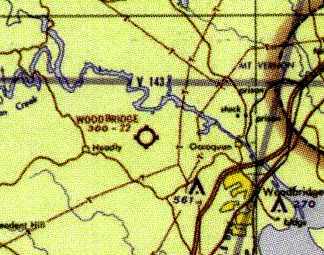 The 1984 USGS topo map depicted Woodbridge as having 2 rows of T-hangars along the southeast side of the runway. A circa 1984 photo by Frank Fisher of a rental Piper Cherokee being refueled at Woodbridge Airport. showing its proximity to the Occoquan River in the background. 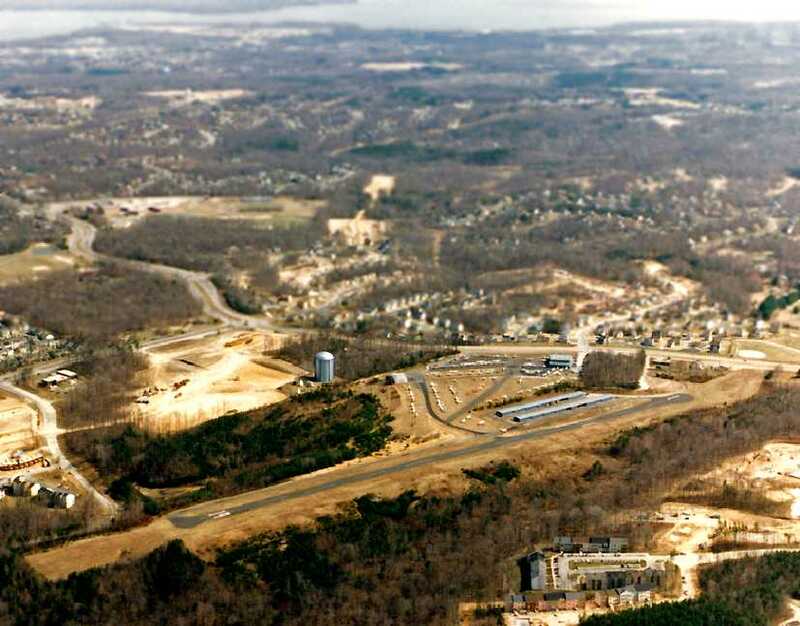 A late-1985 photo by Larry Beaver of Woodbridge Airport, looking north from the shoulder of Old Bridge Road along Runway 1.
was a 1986 aerial view by Larry Beaver looking southwest. showing several hangars along with dozens of light aircraft. Larry Beaver recalled, “I learned to fly at W22. My first flight there was on 3/6/86 in a 152 with CFI Don Yoxhiemer. “The airport did have a reputation as being difficult to land & takeoff from. The runway was only about 50' wide & the dip was quite pronounced. A friend of mine was learning to fly at nearby Manassas Airport. His instructor forbade him from landing there [at Woodbridge]. “Since I learned to fly there I never saw it as particularly difficult. I remember that it was a source of amusement for pilots at W22 that others feared to land there. Woodbridge Airport, as depicted on a 1986 NDB-A Approach Plate (courtesy of John Clifford). Benn was described as "A gruff, colorful 67-year old who has been flying & teaching pilots for 40 years". 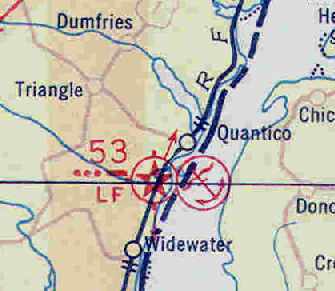 The last aeronautical chart depiction which has been located of Woodbridge Airport was on the March 1987 Washington Sectional Chart. It depicted Woodbridge as having a single 2,200' paved runway, and an NDB navigational beacon. due to rapidly encroaching suburban development. It's closing was lamented by a nice article in the 6/1/87 issue of the Washington Post. The article said that 113 aircraft were based at the field during its final year. Many were expected to relocate to Manassas or Leesburg Airports. gave the airport a reputation among pilots for being unforgiving. said pilot Hal Blank, who said he bought his home in Lake Ridge to be near the airport & now plans to move. Woodbridge was more than simply a place to park their plane. They said they often would spend hours in the main hangar, regaling one another with flying stories." an Arlington resident who based his plane at Woodbridge. most of them small, general aviation facilities." "It's a sad day for general aviation", said Tom Foxworth, a pilot who used to keep his personal plane at Woodbridge. "You need little airports like this." Larry Beaver recalled, “I was very disappointed when the airport closed. An undated photo of the runway of Woodbridge Airport seen during its demolition. The cause of its demise is visible in the upper right - new townhouses. you would never know there had been an airport there now." and the northern half is occupied by housing. The water tower which previously held the airport's rotating beacon is still visible on the right edge of the photo. A January 2010 photo by Brent Deen of what was the last trace of Woodbridge Airport. orange obstruction marker balls on electrical wires at one end of the old runway. The runway, of course, is long gone, and 3 of the marker balls were still there, but I recognized them as such immediately. 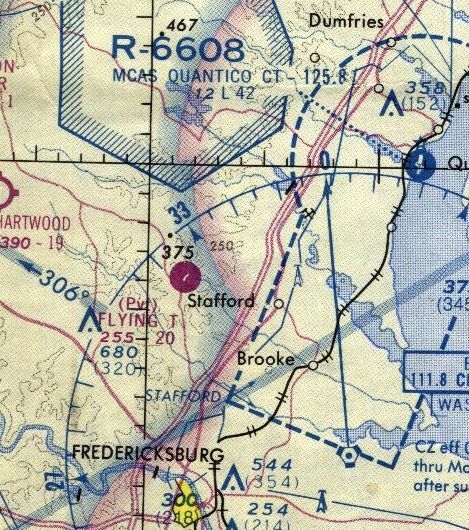 The site of Woodbridge Airport is located northeast of the intersection of Route 641 & Smoketown Road. as depicted on a 5/1/23 Department of Commerce Aeronautical Bulletin. by not one, but 2 earlier airfields on the base. Marine Aviation was established at Quantico when a Marine Aeronautical Company was formed in 1918. The unit initially had 2 kite balloons & 2 free balloons. They were supplemented later that year by 3 Curtiss R-6 seaplanes & one Curtiss R-9 seaplane. 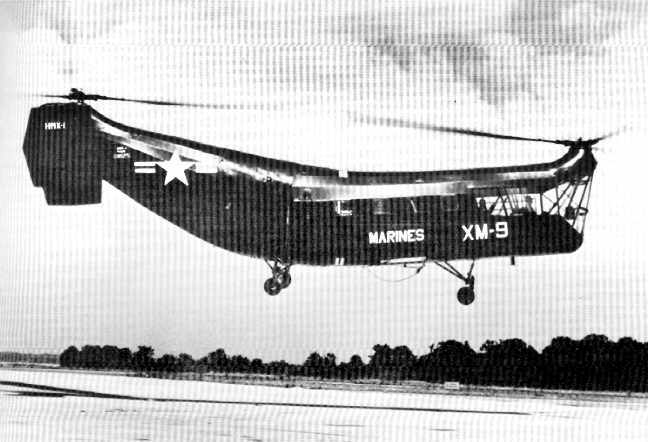 After WW1, a decision was made to concentrate East Coast Marine Corps aviation units at Quantico. A parcel of land south of the Chopawamsic Creek was leased in 1919 for the construction of 2 airfields. in between the Potomac River & the railroad tracks. Field #2, a 2,500' north/south strip, was constructed to the west of the railroad tracks. Work began on the construction of 3 landplane & 2 seaplane hangars. that vehicular traffic had to take a very roundabout inland route from the airfields to the barracks. A causeway was eventually built over the creek, providing a more direct route. Curtiss JN-4, JN-6, and N-6, plus observation balloons. They were supported by a total of 170 aviation personnel. from Washington DC to Santo Domino, Dominican Republic & back. on the captured German battleship Osfriesland & other ships off the Virginia coast. During the return flight, Lieutenant Walter Brown was killed after crashing into the Potomac near the Quantico field. 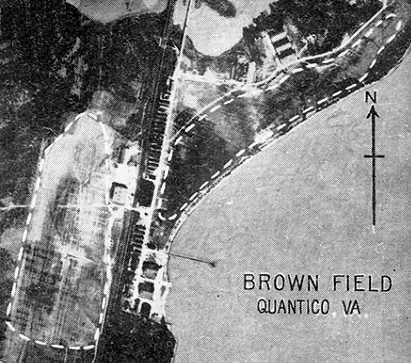 The next year, the Quantico Fields were renamed Brown Field #1 & Brown Field #2 in his honor. with several hangars adjacent to both fields. The earliest photo which has been located of Brown Field was an undated aerial view on the February 1929 V-234 Baltimore-Washington-Norfolk Navy Aviation Chart. It depicted Brown Field as having 2 grass fields, split by the railroad. 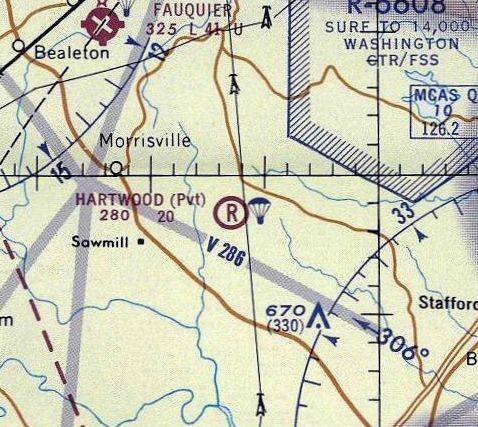 The earliest aeronautical chart depiction which has been located of Brown Field was on the February 1929 V-234 Baltimore-Washington-Norfolk Navy Aviation Chart. with a new airfield with runways sufficient to operate modern aircraft. 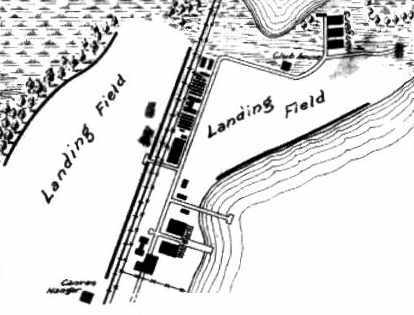 and land was filled in north of the creek to construct Turner Field (the present-day Quantico Airfield). 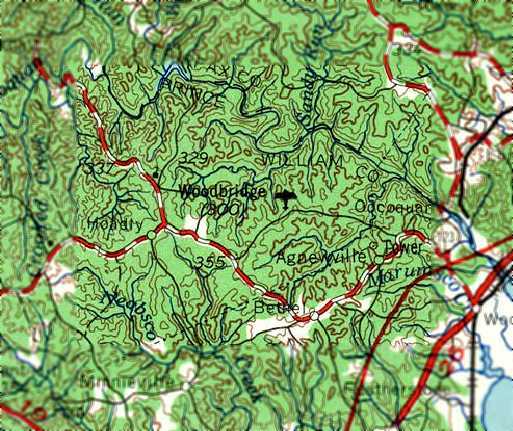 The 1931 USGS topo map labeled the site as Brown Field. 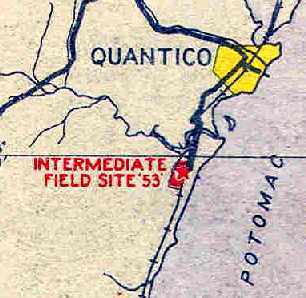 depicted the Quantico airfield as Intermediate Field Site 53.
and Turner Field (the present-day Quantico airfield) under construction in the background. A 1930s USMC view of Brown Field #2. 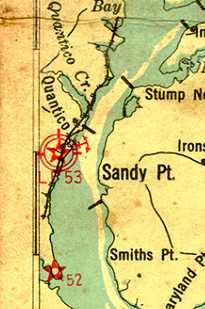 Quantico "Intermediate Field Site 53", as depicted on the 1934 U.S. Navy Aviation Chart (courtesy of Chris Kennedy). 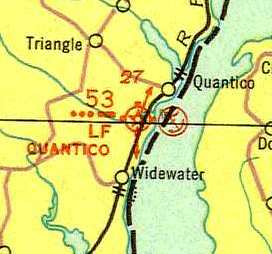 Quantico's airfield & seaplane base, as depicted on the 1935 Washington Sectional Chart. and Turner Field was dedicated in 1936.
for commercial airliners operating along routes between major cities. 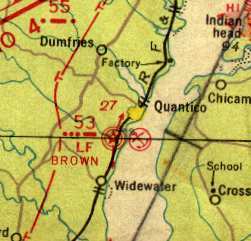 described Quantico as the Department of Commerce's Site 53 along the Atlanta-NY Airway. Hangars were said to be marked with “U.S. Marines”. A 1937 aerial view (courtesy of David Cuff) depicted Brown Field as having a north/south runway, with 5 checkerboard-roofed hangars & at least 6 aircraft. as the Department of Commerce Intermediate Field "Site 53", along the Atlanta-NY airway. and the hangars were said to have "Marine Corps Quantico, VA" painted on the roof. "Brown" Field was depicted on the 1940 Washington Sectional Chart (courtesy of Mike Keefe). only "Turner" Field was depicted at Quantico. A 1943 aerial view of Brown Field #2 (National Archives photo). in a large building on the northern portion of the former Brown Field #1. That building eventually became Quantico's present-day Larson Gym. but its runway was used for parking aircraft going through the Assembly & Repair Department. and the replacement Turner Field at the top-right. to develop the Marine Corps' new tactics in helicopter assault. An undated (circa 1947-50s) photo of HRP-1 "Flying Banana" landing at Brown Field. and a baseball diamond covered another portion. A 1971 aerial photo showed the airfield site & hangars remained largely unchanged. which held a collection of USMC aircraft. Paul Freeman visited the museum in the 1980s. 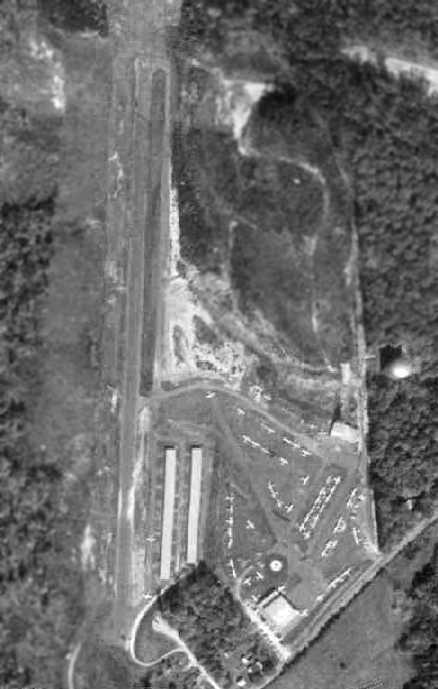 A 1981 aerial photo showed at least 5 aircraft of the Marine Corps Air-Ground Museum on display in between the Brown Field hangars. A 1994 USGS aerial photo of the site of Brown Field #2 (west of railroad tracks) & Brown Field #1 (east of railroad tracks). The end of Runway 2 of the present-day MCAS Quantico Turner Field is at the northeast corner. have been built along the former airfield area of Brown Field #2.
and the former Assembly & Repair Department building on the east side still exists as well. awaiting a move from the Brown Field #2 site to a new location along the east side of Interstate 95. A circa 2010 aerial view looking north at the row of 1920s-era hangars which remain standing along the east side of the site of Brown Field. Thanks to John Voss for pointing out Brown Field. 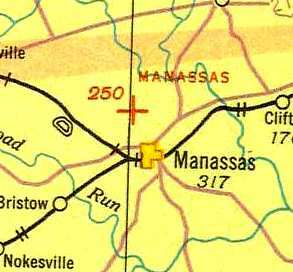 The original Manassas Airport, as depicted on the 1935 Washington Sectional Chart. 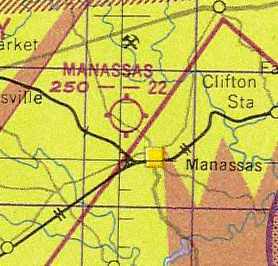 the Manassas Town Council proposed in 1930 that a landing strip be constructed along Route 234 near Manassas. and leased it to the Town in 1931. Over the next few years an additional 12.6 acres were purchased & several improvements were made at the airport. with the longest being a 2,100' northeast/southwest strip. An undated photo of an unidentified biplane in front of a hangar at the original Manassas Airport. 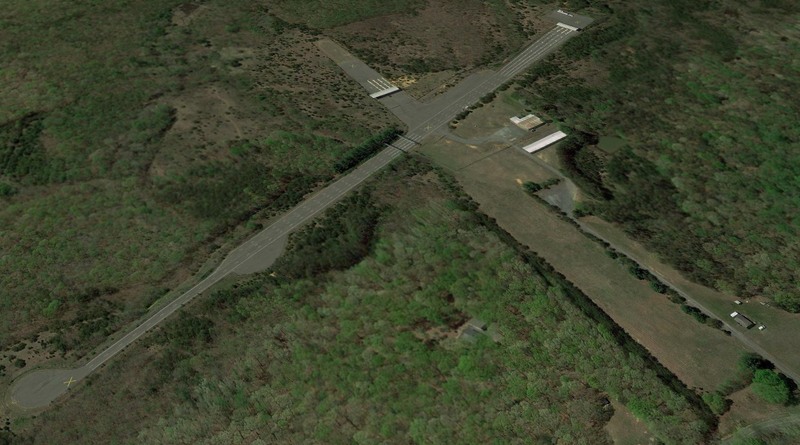 described Manassass Airport as an auxiliary airfield, consisting of a rectangular sod field. It was said to have 2 runways: 2,100' northeast/southwest & 2,050' northwest/southeast. The field was said to offer no servicing. 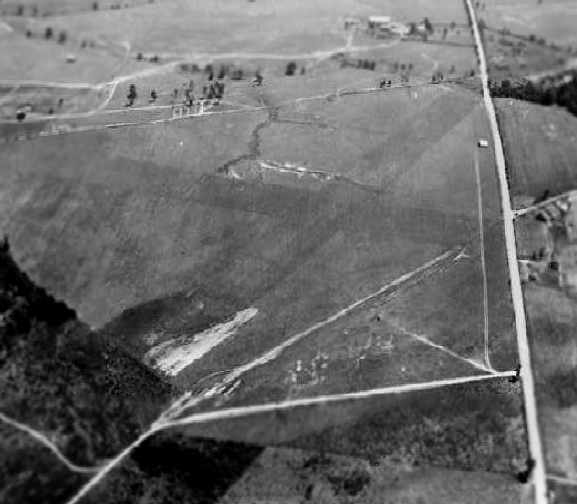 A 1936 aerial view looking southeast at the original Manassass Municipal Airport. "Fancis 'Hobs' Compton began giving passenger rides in August of 1936." 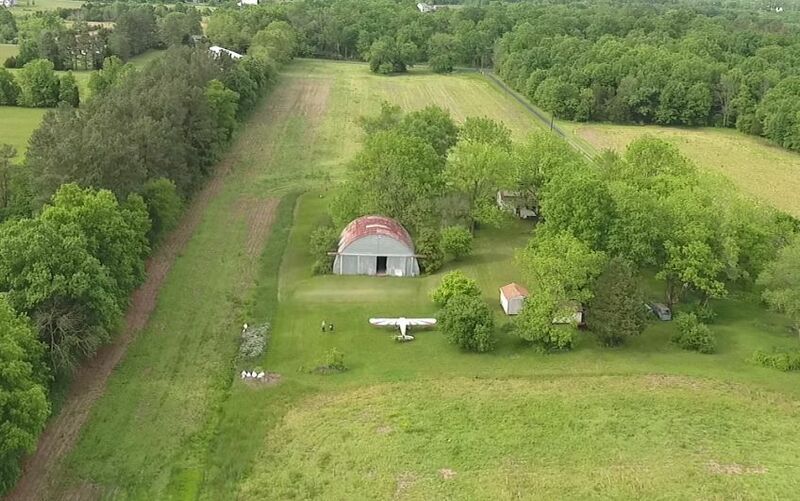 described Manassas Municipal Airport as having two 1,800' runways & a small hangar. A 4/30/37 aerial view (courtesy of David Cuff) depicted Manassas Municipal Airport as having 2 grass runways, with an airport circle marking at the intersection. there were more restrictions on pilots & on flying." as having a 2,200' runway. 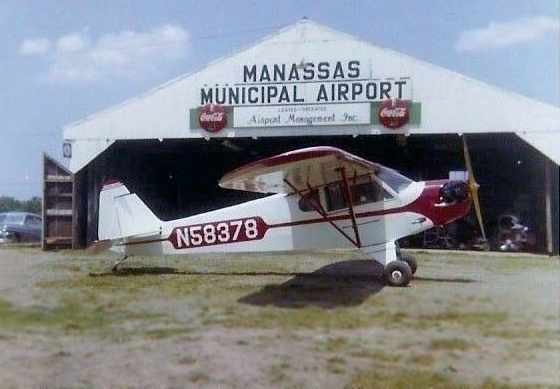 In 1945 the airport was purchased by the Town of Manassas. from the 1945 AAF Airfield Directory (courtesy of Scott Murdock) depicted the field as having 2 grass runways. as a 94 acre irregularly-shaped property within which were two 2,100' sod runways, oriented northeast/southwest & NNW/SSE. 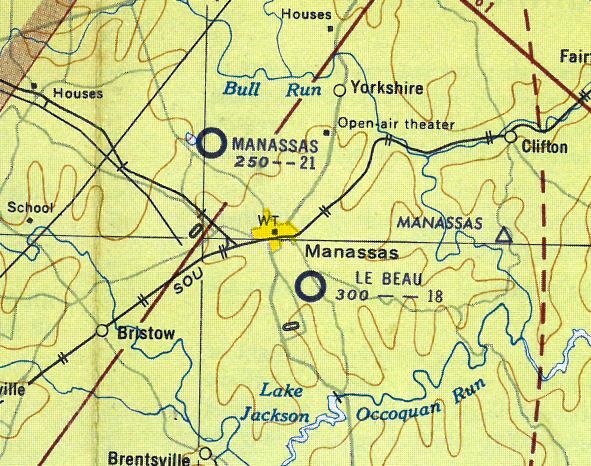 The original Manassas Airport, as depicted on the 1946 USGS topo map. 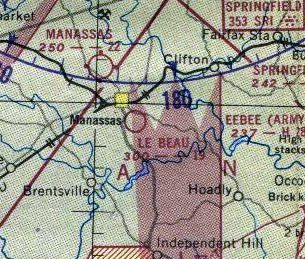 The 1947 Washington Sectional Chart depicted the original Manassas Airport as having a 2,200' unpaved runway. and a second operator took over, the Manassas Flying Service. In October 1949 Dudley Watts became airport manager." as having 2 unpaved runways, with a hangar & 6 light aircraft on the west side of the field. 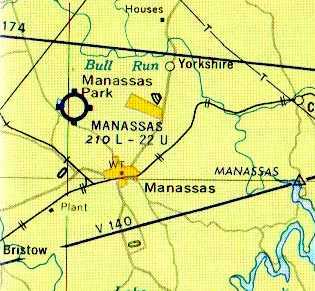 Manassas Airport was described as having 2 runways, with the longest being a 2,160' unpaved strip. 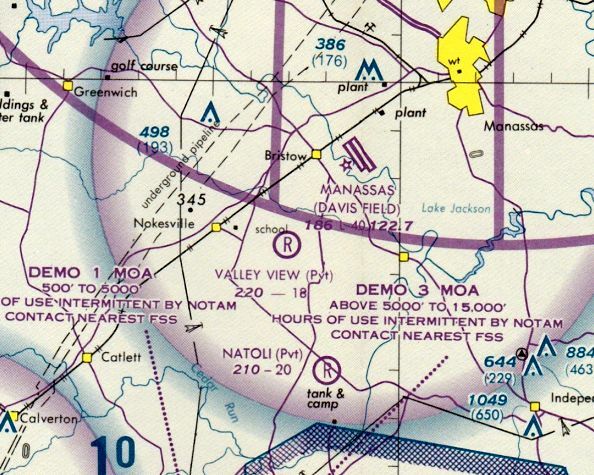 The 1953 USGS topo map depicted the original Manassas Airport as having 2 runways. and taught many to fly in subsequent years. He liked to fly a ski-equipped Piper Cub. It was here, too, that he perfected his Piper Cub Flying Farmer act & helped put on air shows." depicted the original Manassas Airport as having a 2,100' unpaved runway. (according to an article by Linda Burdette in the 1/06 issue of the VAHS Virginia Eagles newsletter). Merton Meade recalled, “The old Manassas Airport was fun, especially when Charlie Kulp ran it. we'd take a couple of Champs to Manassas every weekend to give instruction. At the time Frank Marshall & Dudley Watts were running the place. 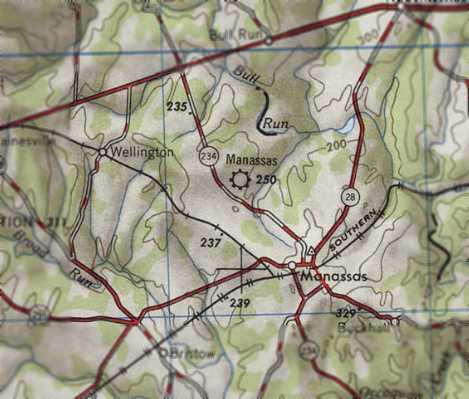 Manassas Municipal was described as having a 2,200' unpaved runway. "In early 1960 ten new T-hangars were built" (according to the book "Virginia Airports"). 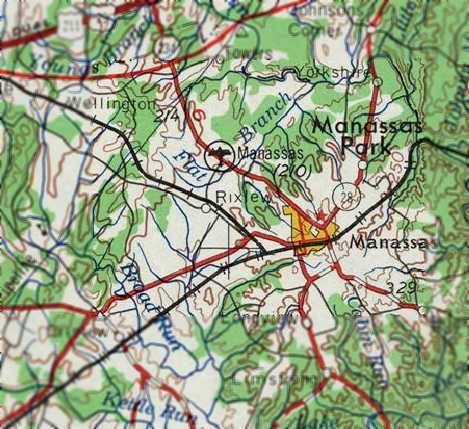 depicted Manassass as having a 2,200' unpaved runway. as having 2 unpaved runways, with 2 hangars & 22 aircraft on the west side of the field. An undated (circa 1960s?) aerial view by Paul Bombardier looking east at the original Manassas Airport. Paul recalled, “I worked part time at this airport from 1960-64 as an Airframe & Powerplant mechanic. At this time, Frank & Evelyn Marshall (Airport Management Inc.) were the operators & managers. A 1962 photo by Paul Bombardier of a 1946 Piper J-3 Cub in front of the hangar at the original Manassas Airport. Paul recalled, “The Piper Cub N58378 was owned by Dudley Watts & Charlie Kulp. the Town saw the necessity of moving the airport to a new location. Property was purchased for a replacement airport in 1963, four miles to the south. 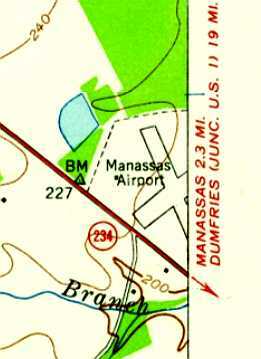 The original Manassas Airport, as depicted on the 1963 USGS topo map. as having 2 runways, with the longest being a 2,260' turf strip. 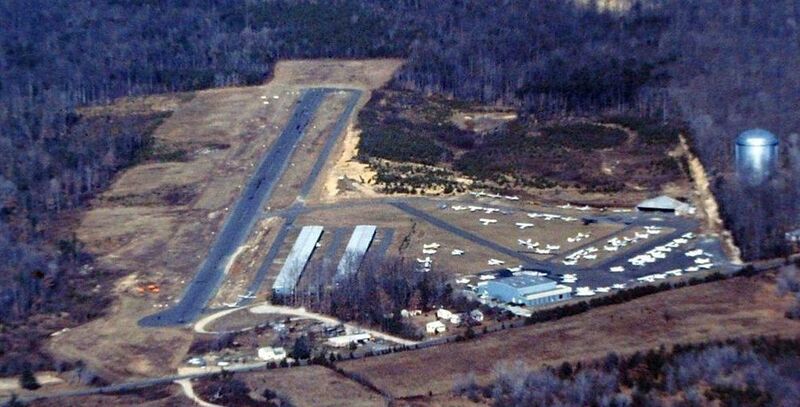 A 1964 aerial view showed a total of 10 light aircraft parked outside at the original Manassass Airport. 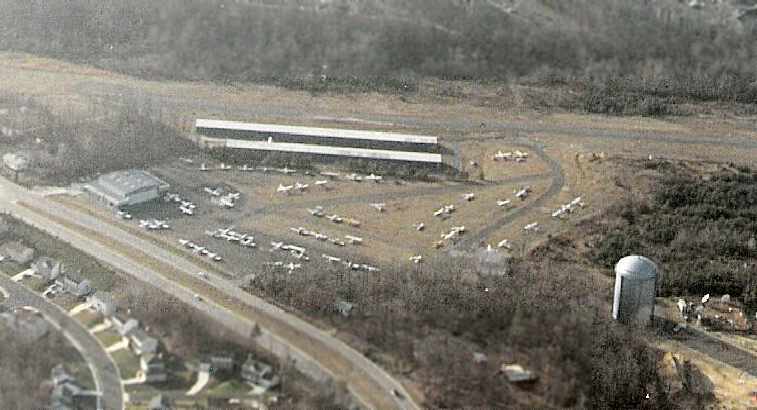 The property of the original Manassas Airport was sold to shopping center developers Lindsey & Waldron on 4/17/64. at which point the old airport presumably was closed. which was also operated by Frank Marshall's Airport Management. with the row of T-hangars having just been removed, but the main hangar still remained, as well as the runways. only the new Manassas Airport was depicted - the original Manassas Airport was no longer depicted at all. 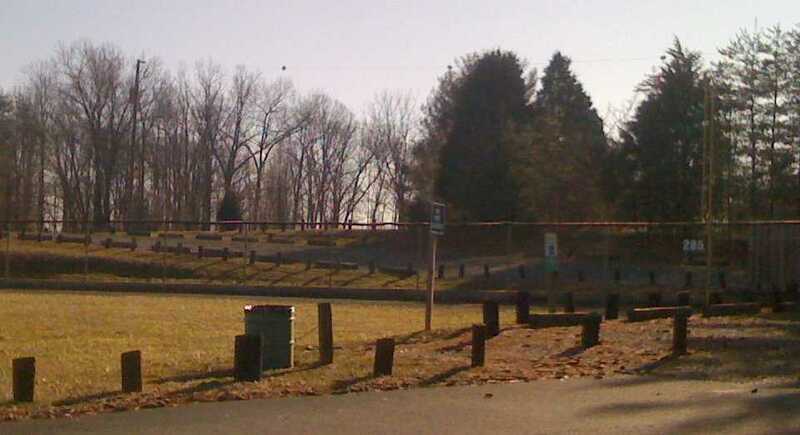 with not a trace still visible of the original Manassass Airport. 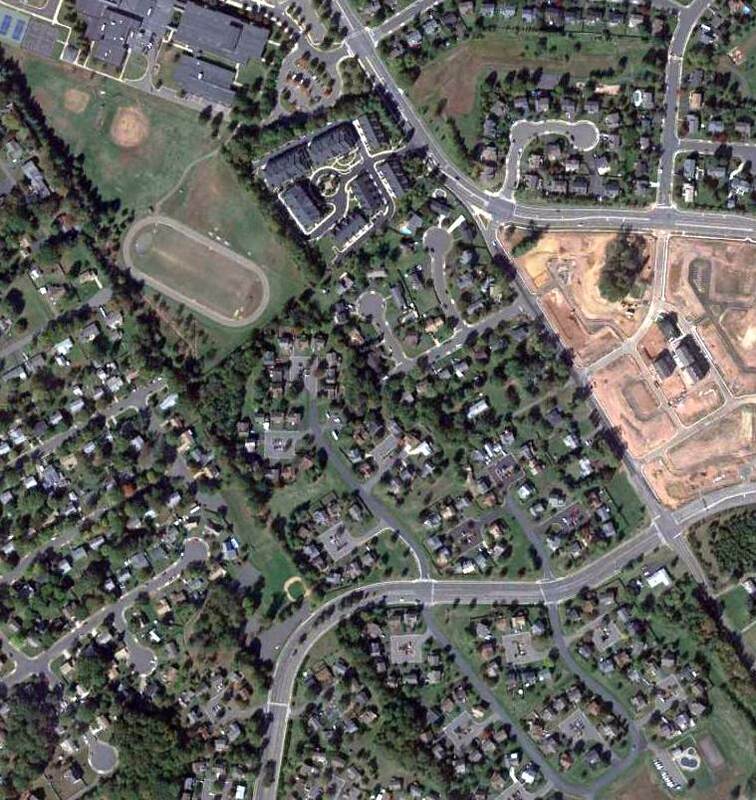 A 2018 aerial view looking northeast at the site of the former Manassas Airport, now occupied by the Manaport Shopping Center & houses. Not a trace remains of the former airport. 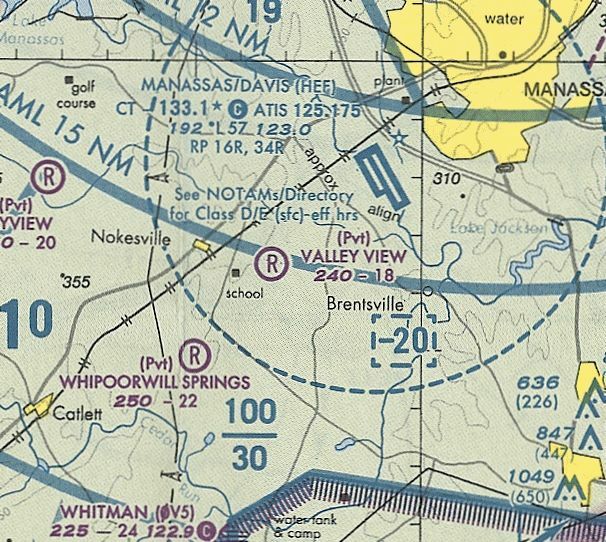 The site of the original Manassas Airport is located on the northeast side of Route 234, directly across from the Manassas Mall.